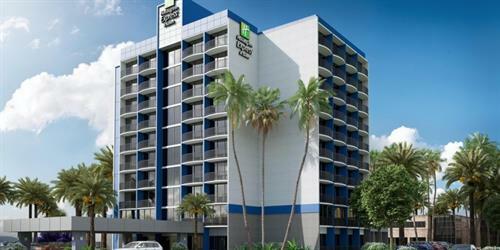 BRAND NEW Holiday Inn Express & Suites Orange County- Santa Ana is the perfect location for business and leisure travelers alike. We are centrally located near the most popular Orange County attractions, such as Disneyland, Santa Ana Zoo, Angels Stadium, John Wayne Airport, and South Coast Plaza. 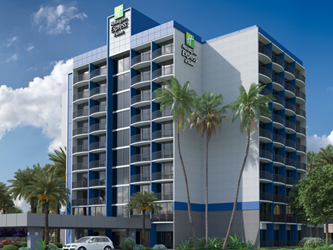 Our hotel offers eight meeting rooms, each approximately 600 square feet of space that is ideal for any event, while complimentary wired and wireless high speed internet access will help keep everyone stay connected. While you are staying with us be sure to take advantage of our many on site amenities. Begin your day with our complimentary hot Express Start breakfast bar and relax in our outdoor heated pool when you return in the evening. Set your pace in our fitness center with state of the art cardio machines, strength training equipment with 24/7 access. Should you need to utilize our business center you will have all the tools you need to stay connected with printer and fax services available.